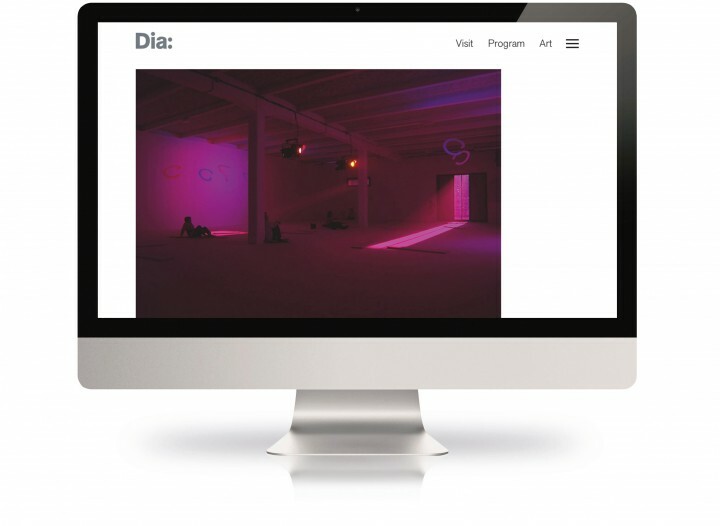 Dia Art Foundation is a cultural institution founded in 1974 based in New York with two galleries (Dia: Beacon and Dia: Chelsea). It is committed to advancing, realising, and preserving the vision of artists. They needed a new online presence and platform for the preservation and future growth of the organisation, Keepthinking were chosen to lead the design and development for this goal. 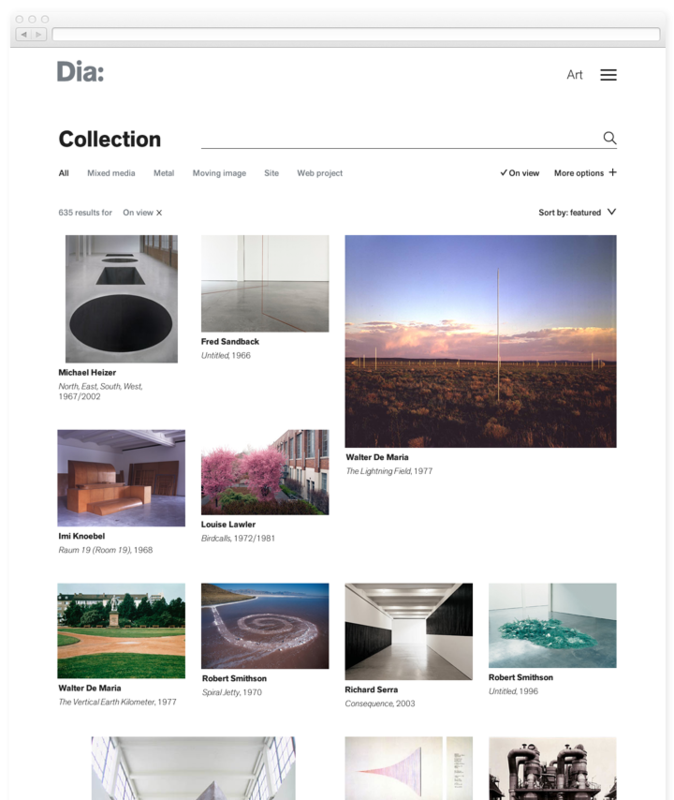 We created a versatile structure of content arranged in separate modules rather than a linear path, allowing Dia to build and arrange each page to their appropriate needs. 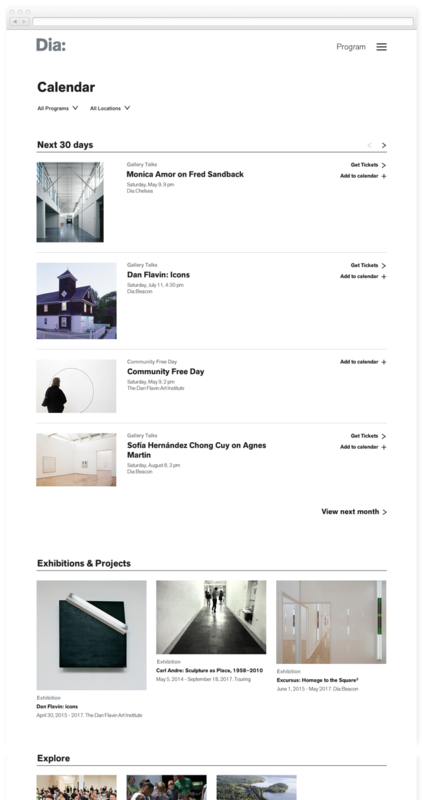 Keepthinking introduced a new art direction in context with the contemporary nature of the content in the collection, visualised with a simple and modernistic attitude allowing the content to be the central point of focus. 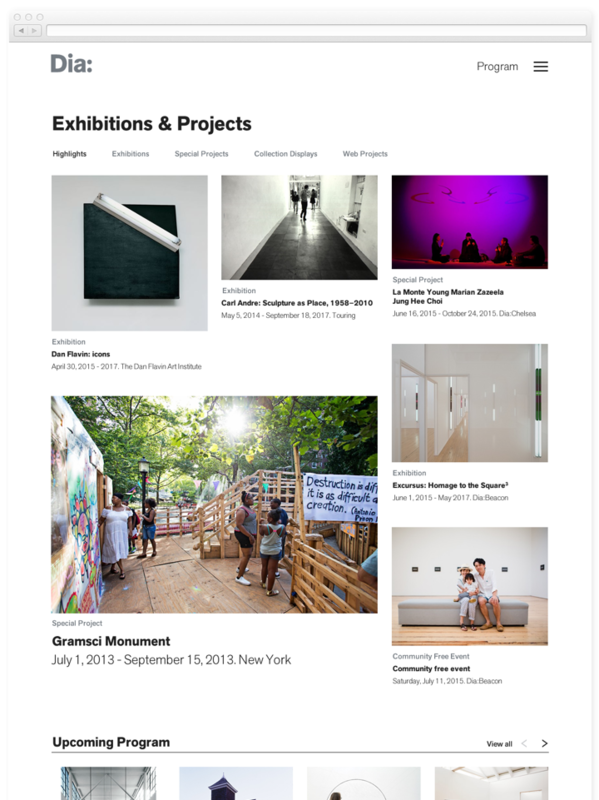 Capabilities with the content structure in Qi allows users to find out unique and detailed information on individual visits, events and exhibitions such as: accommodations, photography restrictions, locations, directions and more. Users are encouraged to progress through the website with relevant information located on each page. The versatile nature of the design allows the expression of different types of content within the same section, the website is fully responsive for monitors, laptops, tablet and mobile. We rationalised applicable sections for the clients requirements. This included a calendar with added functionality for purchasing tickets and relevant access information, as well as the ability to add Dia events to their own personal calendars. We express the notion of moving forward through user-experience by defining paths of related content. 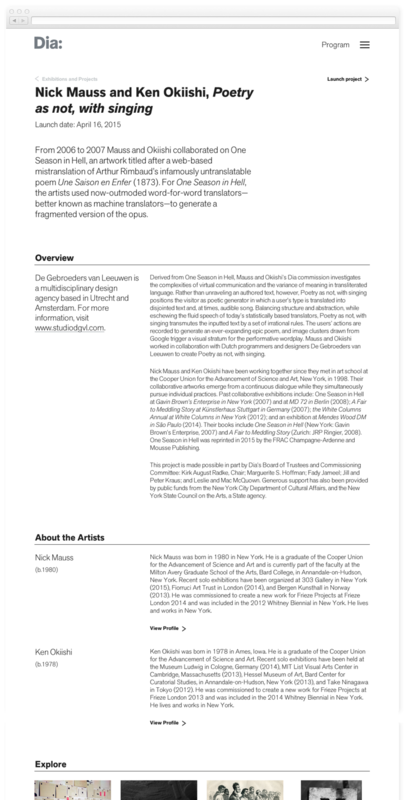 This can be in the form of artists/people involved in an event or piece of work with links to profiles, similar pages and other content part of the same whole, as well as any exhibitions or events relating. Ultimately this is available to what the client decides as relevant to a particular piece of content. For the collection we realised filtering and sorting options as well as advanced searches. 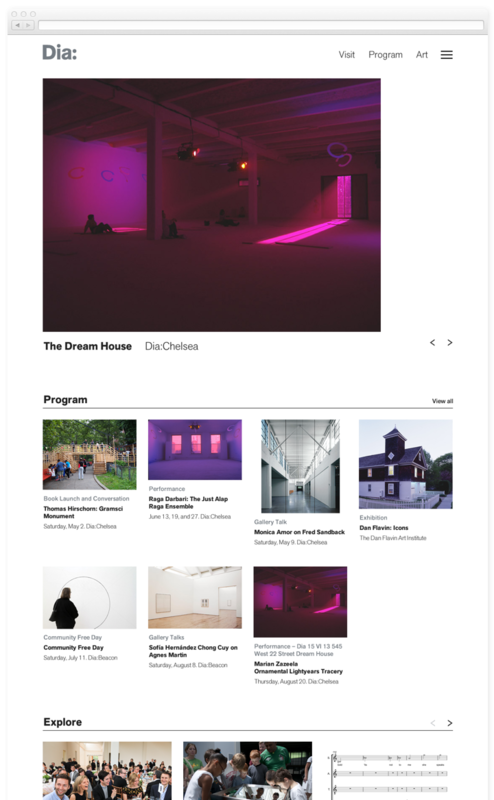 The user can choose to see only what is currently 'on view', as well as being connected to the exhibition an artwork may be included in, the artist(s) involved and specific details about the artwork. 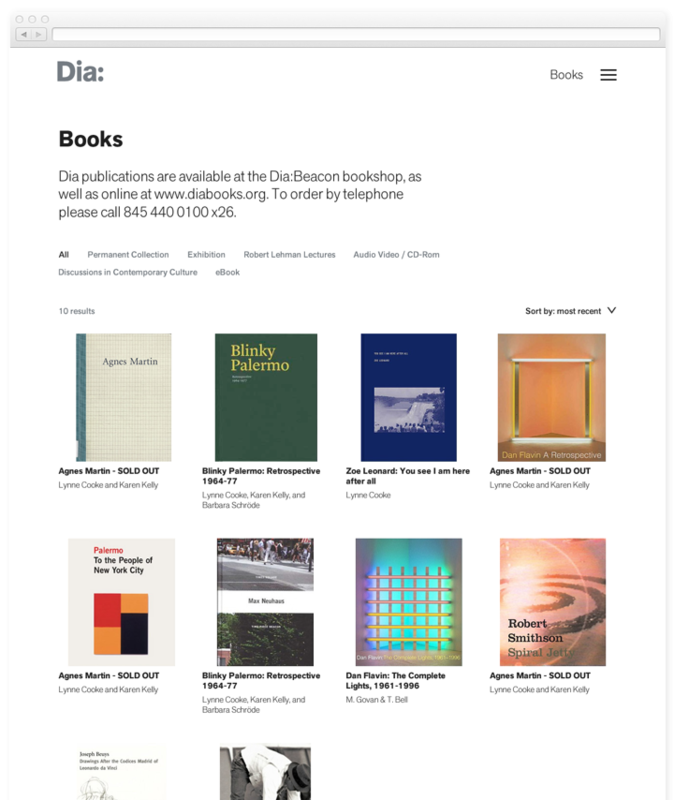 The 'Books' section provides users with information on books available from Dia:Beacon and online. We are currently working on developing a completely new 'Shop' section controlled by Qi with added functionality for Dia's needs.